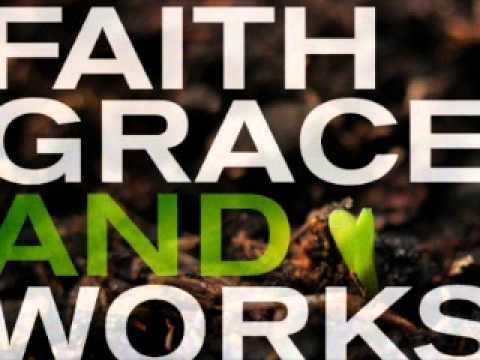 Grace, Faith, Works and Obedience - How Do They All Work Together? "FOR by grace are ye saved through faith; and that not of yourselves: it is the gift of God:" Ephesians 2:8. Now, being saved by grace is a wonderful thing isn't it? It is a gift from God just as Ephesians 2:8 says. If we were to look up the word grace in the dictionary we would find many definitions. One definition that I especially like is, "the freely given, unmerited favor and love of God." There are others also that I like, "mercy; clemency; pardon." So we can see that grace is unmerited favor from God to man. We can not earn grace or mercy or pardon, it is a free gift. Praise God for that! That is why it says in the very next verse, that we would boast if we could work our way to heaven. "Not of works, lest any man should boast." Ephesians 2:9. So, we can not work our way to heaven by our good works, but we should have good works, shouldn't we? "Let your light so shine before men, that they may see your good works, and glorify your Father which is in heaven." Matthew 5:16. The point is, we cannot work our way to heaven, but because we have been redeemed by the blood of the Lamb, we will have good works - not to be saved, but because we are saved. If Jesus Christ is living and dwelling in our hearts, we cannot help but have good works in our lives, doing good for others, helping those less fortunate than ourselves. Letting our light shine before men, so they will glorify our Father which is in heaven. That is true Christianity. If we are doing good for others so that we will bring glory to ourselves, then we have the wrong motive. Also, don't forget that Jesus is going to reward us according to our works. This does not do away with grace, we are still saved by grace. You see, works is very closely associated with faith. If we say we have faith and do not have corresponding works, then do we really have faith? "What doth it profit, my brethren, though a man say he hath faith, and have not works? can faith save him?" James 2:14. "Even so faith, if it hath not works, is dead, being alone. Yea, a man may say, Thou hast faith, and I have works: show me thy faith without thy works, and I will show thee my faith by my works." James 2:17,18. So, faith without works is dead. If we have faith, we will have corresponding works. But our works will not save us, because we are saved by grace. But our works will be judged and rewarded. So, as you can see, works is not a dirty word as some Christians would have you believe. But we have to look at our motives and decide if we are doing things for the right reasons or not. "And being made perfect, he became the author of eternal salvation unto all them that obey him;" Hebrews 5:9. "And to you who are troubled rest with us, when the Lord Jesus shall be revealed from heaven with his mighty angels, In flaming fire taking vengeance on them that know not God, and that obey not the gospel of our Lord Jesus Christ: Who shall be punished with everlasting destruction from the presence of the Lord, and from the glory of his power;" 2 Thessalonians 1:7-9. "And, behold, one came and said unto him, Good Master, what good thing shall I do, that I may have eternal life? And he said unto him, Why callest thou me good? there is none good but one, that is, God: but if thou wilt enter into life, keep the commandments. He saith unto him, Which? Jesus said, Thou shalt do no murder, Thou shalt not commit adultery, Thou shalt not steal, Thou shalt not bear false witness, Honour thy father and thy mother: and, Thou shalt love thy neighbour as thyself." Matthew 19:16-19. If thou will enter into life, keep the 10 commandments, Was Jesus doing away with grace and instituting works? Of course not. He was simply stating that in order to enter heaven, you have to be a commandment keeper. And remember we keep the commandments because we are saved, not to be saved. From the following verses, you will see that by keeping God's commandments we show our love to Him and if we say we know God and keep not His commandments we are liars and the truth is not in us. "If ye love me, keep my commandments." John 14:15. "And hereby we do know that we know him, if we keep his commandments. He that saith, I know him, and keepeth not his commandments, is a liar, and the truth is not in him." 1 John 2:3,4. "And he that keepeth his commandments dwelleth in him, and he in him. And hereby we know that he abideth in us, by the Spirit which he hath given us." 1 John 3:24. "Here is the patience of the saints: here are they that keep the commandments of God, and the faith of Jesus." Revelation 14:12. If we do His commandments, we will have right to the tree of life. People can confuse Revelation 22:14 (see below) with works, but it is pure and simple obedience. It doesn't take anything away from being saved by grace. Obedience and faith and works are the fruits of our conversion. It is an outward sign of our inward heart condition. God will accept nothing less, if you believe He will, you are only fooling yourself. Its really not that complicated, its only when we try to get to heaven on our own terms and go contrary to the Bible that we make it complicated. We are saved by grace, not by works of the law. "Therefore by the deeds of the law there shall no flesh be justified in his sight: for by the law is the knowledge of sin." Romans 3:20. The experience of salvation by grace, however, results in obedience to God's law. Works of faith demonstrate that Christ's grace is operating in the life to bring us into accord with the righteous principles of His law. We are judged by the law, the great standard of righteousness because Christ's grace has been made available as the power to obey it. Our works are judged because grace makes possible works that are acceptable to God. Obedience is a sign of our love for God and our willingness to render Him true worship. "If ye love me, keep my commandments." John 14:15. Obedience through the power of the Holy Spirit is not legalism. "And he that keepeth his commandments dwelleth in him, and he in him. And hereby we know that he abideth in us, by the Spirit which he hath given us." 1 John 3:24. "Blessed are they that do his commandments, that they may have right to the tree of life, and may enter in through the gates into the city." Revelation 22:14.